Rival militias have fought each other in Tripoli’s Hay Andalous in a dispute over who should be guarded the local branch of the National Commercial Bank. The frontages of the bank and neighbouring stores were damaged but there were no reports of any injuries. It is understood that a militia calling itself “The Rapid Intervention Force” had for some time taken upon itself the protection of this NCB branch. Their control was challenged by a Misratan group who locals said is headed by two individuals known as “Muza” (Goat) and “Asfur” (Sparrow). It is unclear which of these armed groups is now protecting the bank branch. 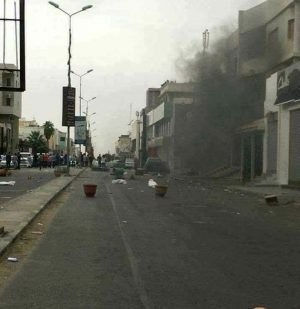 Earlier this month, a similar dispute in Seyahia, thought to be between the same groups, left five people dead outside a black market money changers which was torched. Since the Revolution banks have become regular targets for gangs. In August the Central Bank said that beginning in 2012, there had been 56 attacks on banks. These ranged from armed robbery, murders, staff kidnapping, armed threats, destruction of bank property, armed blockades as well as attacks on vehicles moving money to and from branches.